This isn't a project that I can show at my sewing presentation, but I can post this on my blog to show what I have been knervously knitting for a bit. I love Knitpicks Dishy yarn, and I can almost knit a garter stitch dishcloth without even looking. Perfect for evening-time tv watching. I actually sold about 16 of the knit squares to a beauty salon. Not sure what she is going to do with them, but I covered the cost of the yarn and about $1.00 for my knitting effort. Yep. Not much of a money-maker, but the fewer of these knit squares I have piled around the house, the happier the children are when they come to visit. The piles of squares seem to make them knervous. So, I got this great idea - knit 8 squares end to end to make a long scarf. Half way through this project, I knew I was going to like it. Carl also thought the scarf's colors were pretty fun. I just bet if I stack up a bunch of these scarves, they just might disappear when the kids and grandkids come to visit. I suppose these scarves could also be cut apart for dishcloths, just in case you run out. 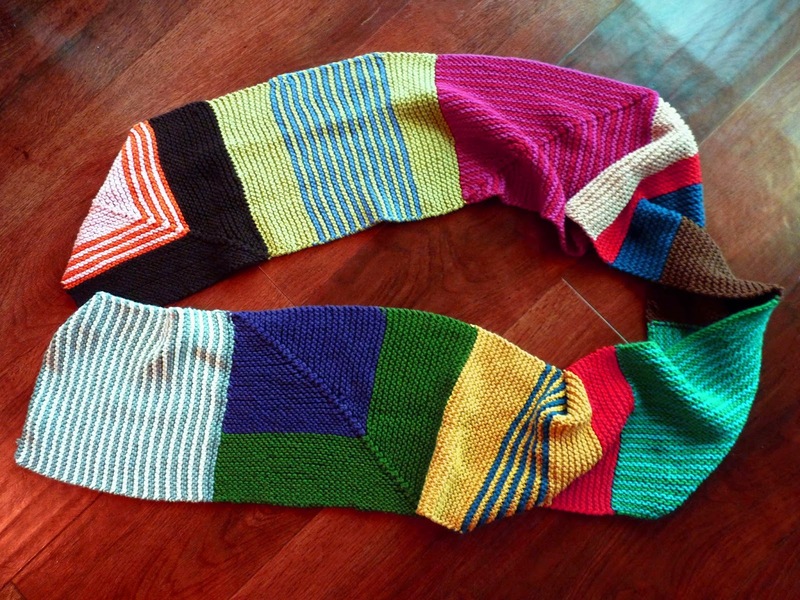 This is a great knervous knitting project!